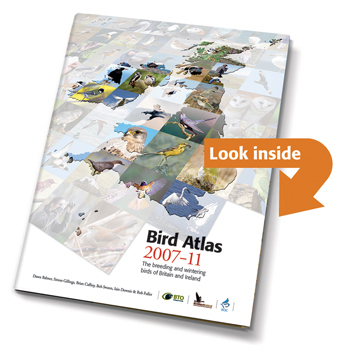 Bird Atlas 2007–11 is now complete and with the printers. We should have proofs of its 720 pages (rather more than we expected!) at the start of October and delivery is expected in mid-November, in time for distribution ahead of the Christmas rush. Long, winter nights will be spent poring over individual maps and reading the chapters that reflect on some of the general patterns across groups of species and habitats. In this context, the change maps for Green Woodpecker are both interesting in their own right and potentially indicative of problems for a group of ground-feeders associated with grazed farmland in western Britain. The design of the cover of Bird Atlas 2007–11 (right) has had to be stretched, in order to make more space to wrap around the wider spine. With more space dedicated to analyses and comparisons, as well as a few extra species, the page length has grown from 620 to 720 pages. Purchasers will be getting an even better deal. When talking about distributional change, I have always included Green Woodpecker in the group of species that is spreading north – like Nuthatch and Lesser Whitethroat. Looking at the maps from the 1968–72 and 1988–91 breeding atlases it is easy to focus on new sightings north of the Great Glen and along the coastal strip, east of Inverness. 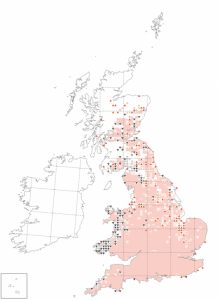 By 1988–91, some new gaps had appeared in the south-west of England, in Wales and in south-west Scotland but the impression of loss is mostly created by reductions in the levels of breeding evidence. The map alongside brings in the latest results from 2008–11; you can increase the size by clicking on it. An obvious feature is the number of black downward-pointing triangles, indicating losses in the last twenty years, with many of these in coastal Wales but also with losses in a number of other western areas. In contrast, there are lots of new 10-km squares in the east in which the species now breeds, indicated by red upward-pointing triangles. Whilst darker salmon shows squares in which Green Woodpecker was reported in each Atlas period, light salmon means ‘present in 1968–72, not detected 1988–91 and present 2008–11’. It is unclear whether these are squares where Green Woodpeckers did truly disappear in the middle period, or whether they occurred at very low density and were missed. The change in breeding distribution (left): red upward-pointing triangles are new gains since 1988–91, open upward-pointing triangles are gains between the first two breeding atlases and solid salmon areas have been occupied since at least 1968–72. Downward-pointing triangles indicate losses; black are recent losses and open triangles are losses between 1968–72 and 1988–91. Green Woodpeckers are basically sedentary; the median recovery-distance for adults is 1km and for juveniles is 3km, with the longest movement recorded by BTO ringing being 71km, during the harsh winter weather of early 1963. Unsurprisingly, therefore, winter atlas maps are very similar to breeding ones. The nice thing about the winter map, as shown alongside, is that the 26-year period between 1981–84 and 2007–11 seems to show the losses more clearly than the breeding season maps, possibly because it is better synchronised with the period of decline? The rash of downward-pointing black triangles are distributed across western Britain, while the blue upward-pointing triangles are in the east. Relatively mild winters may explain the spread across the colder eastern areas but why the retreat from the west? Distribution changes between the two winter atlases (right): blue upward-pointing triangles indicate gains and the smaller number of black downward-pointing triangles are losses. by BTO and jointly funded by BTO, JNCC and RSPB. Atlas projects give us a periodic review of distributions. In the intervening years, chicks are produced, youngsters disperse and birds die – all processes which influence population levels and the ways that birds are distributed. For Green Woodpecker, we do not have sufficient information from the Nest Records Scheme or from ringing to see if there are difference in productivity and survival which explain the losses in some areas and the gains in others. However, we do have annual Breeding Bird Survey numbers, which show that there have been marked differences in population trends across different areas. The in-filling of 10-km squares in the east is reflected in huge increases in numbers – more than doubling in 16 years. At the other end of the spectrum of change, there is a deline of 19% in Wales that may well not be distributed evenly across the principality. I wonder what’s happening?